Valentine’s Day may be over, but it’s always fun to share the love with friends and family alike. Our Friends release includes many ways to show love and appreciation, but you might remember some pretty spectacular products from last year’s Hey Love collection. In celebration, let’s take a look at some cards from our Hey Love release! 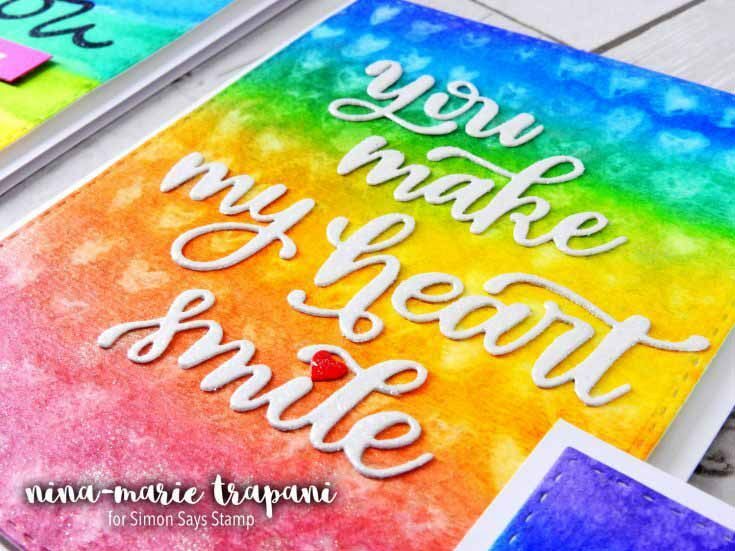 Nina-Marie created a whole slew of gorgeous cards focused around the Hey Love release and Prima Watercolor Confections. This card in particular features our You Make My Heart Smile die. The white really pops off all of that fabulous color, doesn’t it? If you’d like to see how this card (and several others) were created, you can watch Nina-Marie’s informative video HERE. And you can see Nina-Marie’s original post HERE. In her original blog post, Jessica admitted a bit of an obsession with Simon Background Stamps, and honestly, we can’t blame her! For this card, she featured the Elizabeth Background Stamp dressed up in beautiful gold heat embossing and rich blues and greens. 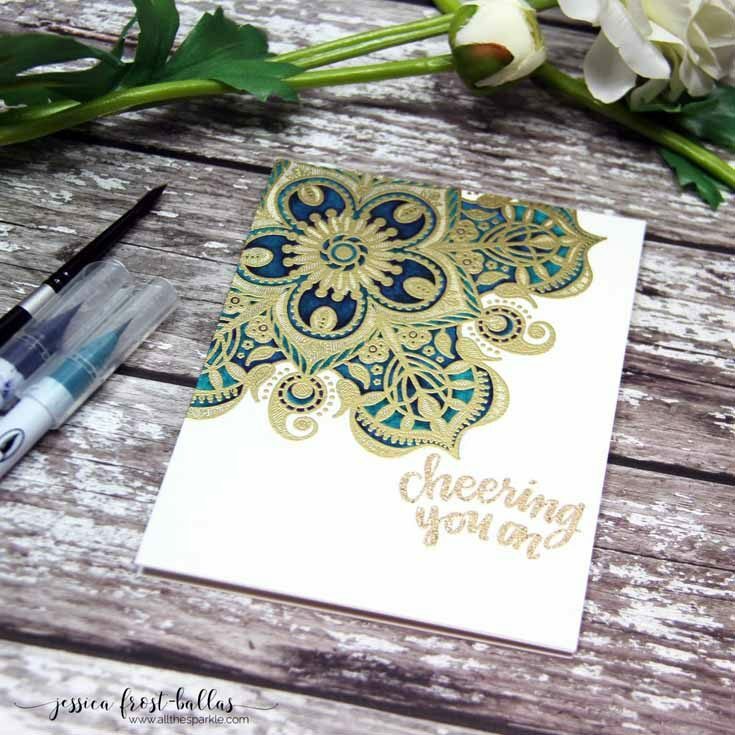 The gorgeous sentiment from our Hand Lettered Encouragement stamp set is the perfect finishing touch. 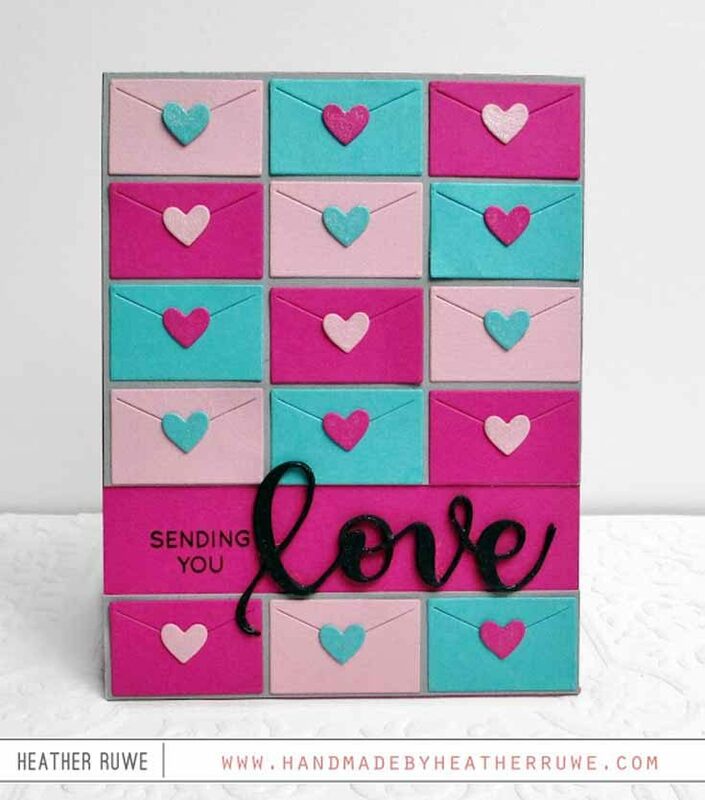 Loads of saturated color and a pleasing grid design make Heather’s cheery Valentine’s Day card a stand-out. Our Envelope Purse Die isn’t big, but repeat it several times, and you’ve got a unique design with lots of impact. Heather added just the right contrast with her sentiment in black using the Love stamp set and Love die from our Hey Love release. Visit Heather’s original post HERE. Our last throwback project is this stunner from Marge Yoon, and it comes from our New Beginnings release. 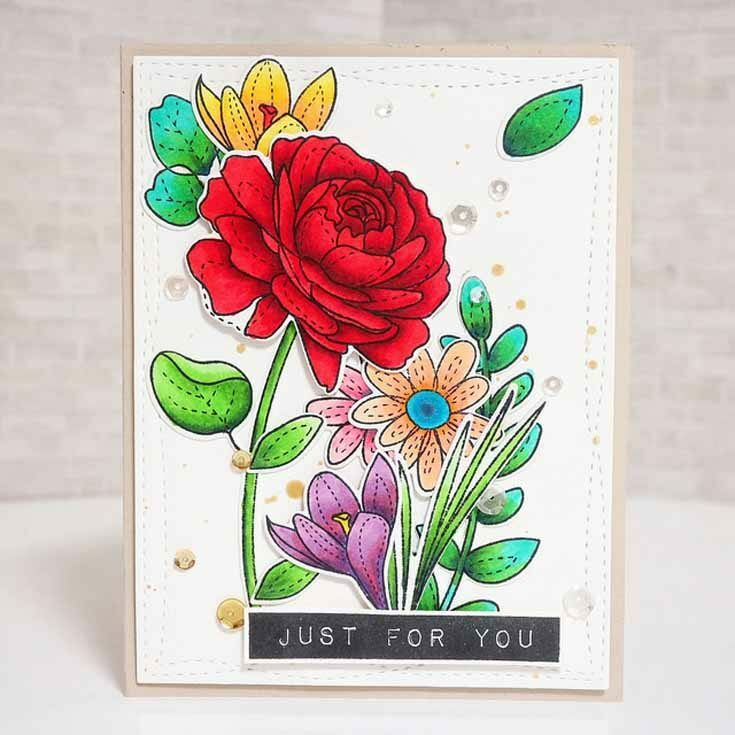 Marge gathered a pretty bouquet of flowers on this lovely card using our More Spring Flowers stamp set. Such a lovely design with a wonderful and heartfelt sentiment. You can see Marge’s original post on her Instagram feed HERE. Thanks for sharing throwback Thursday. All the cards are nice especially the cheering you on card made by Jessica. I just love the 2nd card. And I have that stamp, so I can even try it out! Thanks so much for the post and ideas. Wow! Awesome cards!!! Jessica’s one is simply breathless!!! All three are so unforgettable! Thanks for this reminder…..
Love those cards!! Thanks for sharing!! Pulling old things we own back out is always a good idea. Thanks for showing us these wonderful projects again. Fabulous cards! Love the richness of Jessica’s embossed card! Gorgeous! Happy Throw back Thursday. Love the card by Jessica, it is absolutely beautiful!! Thanks for Throwback Thursday! Always a pleasure to see these gorgeous card again and again. Great inspiration. Nice idea to take a look at some previus designs. I like to do this myself at times. Great inspiration! Thanks for the throwback! I missed Heather’s card and love the array of envelopes! Great card inspiration! Jessica’s is absolutely stunning! Thanks for this Trowback, somehow I misted the gorgous card of Jessica and like her, I love the SSS Background stamps. What beautiful cards! I love seeing cards I might have missed the first time around. Thanks for posting these. I like how Heather used that small envelope die! Beautiful cards to get the creative juices flowing. Thanks for the inspiration. Lovely projects from the past–thanks for sharing with us! Like the mini envelopes die. I do love throwback Thursday in case you miss anything, like I didn’t see Heather’s card, I love that and think I need that die, thanks for the update. These are all fantastic cards ladies. I ALWAYS love seeing throwbacks from previous releases. Speaking for myself, (with no income), I cannot keep up with all of the new products coming out and we don’t have time to use and enjoy all of these great sets from the past as they seem to become passé far too quickly…. So beautiful! And such a wide variety of techniques. Gorgeous! I love the glittered words. I love this feature – there were some things I’d missed – thanks! Even better the second time around!!! Fantastic cards!!! Wonderful projects to revisit – they are all beautiful! These cards are outstanding, especially the last card with all of the beautiful bright colors. Thanks for sharing. These were great choices for reminding me of things I have missed. I especially like Jessica’s card. Summer School with Jennifer McGuire!